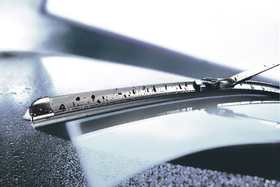 Bosch sued to protect patents on wipers it says clear curved windshields more efficiently. WILMINGTON (Bloomberg) -- A U.S. unit of Robert Bosch GmbH won a ruling from a jury that rival Pylon Manufacturing Corp. infringed one of its valid patents for high-performance windshield wipers. The federal court jury in Wilmington, Delaware, deliberated in a six-day trial before also deciding that some claims of two other Bosch wiper patents are invalid because the inventions obviously weren't new. Pylon distributes its wipers under the Toyota and Michelin brands to retailers including Wal-Mart Stores Inc., according to court documents. Pylon copied Bosch's wiper because it “wanted to capitalize” on Bosch's success, Bosch attorney Mark Hannemann told the court. Pylon lawyer Gregory Hillyer told the court that the patents were invalid because the inventions weren't innovative and that Pylon's products didn't have the same features as Bosch's. “The patents should never have been issued,” he said. Lawyers on both sides declined to comment after the verdict. Bosch spokeswoman Cheryl Kilborn didn't immediately return phone messages seeking comment. Pylon officials weren't immediately available to comment. Bosch sued Pylon, a subsidiary of Deerfield Beach, Florida-based Qualitor Inc., in 2008 for using protected inventions for wipers, which clear curved windshields more efficiently and resist lifting at high speed due to the wind. The trial was supervised by U.S. District Judge Sue L. Robinson, who will hear post-trial motions on the verdict later. A trial on damages hasn't yet been scheduled. Bosch, based in Stuttgart, Germany, is a world leader in auto parts.